President Donald Trump has raised eyebrows for once again arguing that wind turbines are a poor source of electricity, stating people would have to turn off their TVs because "the wind isn’t blowing." During a rally in Grand Rapids, Michigan, on Thursday, Trump told supporters: "If Hillary got in…you'd be doing wind." Apparently confusing windmills and wind turbines, and impersonating the sound the devices make, he continued: "Windmills. Weeeee. And if it doesn't blow, you can forget about television for that night." Taking on the persona of a man watching TV with his partner, Trump said: "'Darling, I want to watch television.' 'I'm sorry! The wind isn't blowing.'" 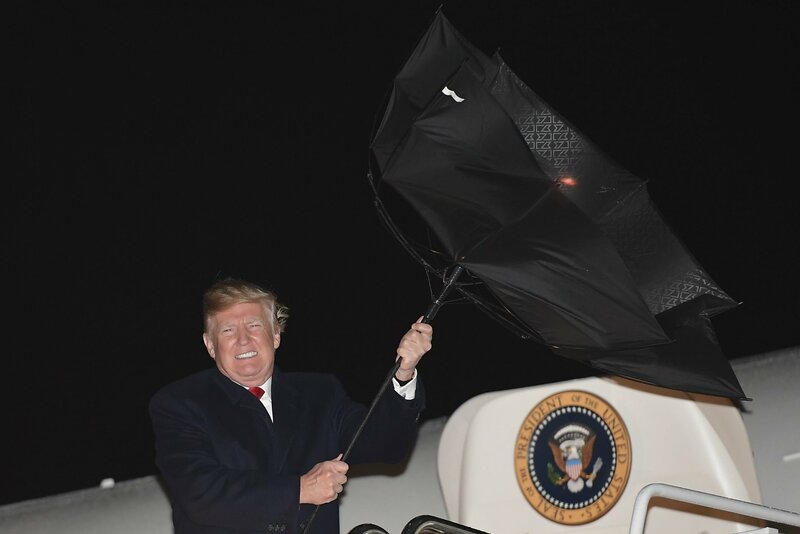 The president added: "I know a lot about wind." 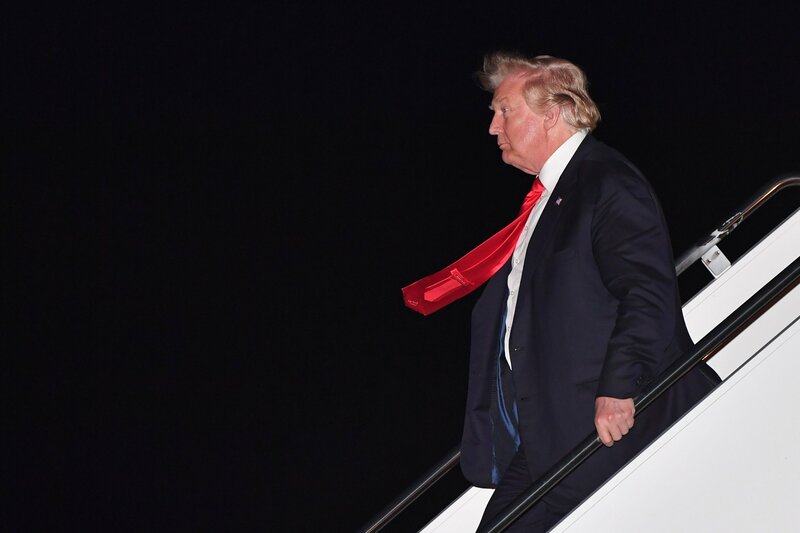 Michael Mann, a professor of atmospheric science at Pennsylvania State University, told Newsweek the comments amounted to “malicious ignorance” from the president. "The fact that he has repeated this lie indicates that it is intentional and malicious in nature," he argued. "The truth is that a combination of wind, solar and other renewables, along with battery and smart grid technology, can provide continuous and abundant electricity," Mann said. Trump made a similar claim during an interview with Fox News host Sean Hannity on Wednesday, when he argued that collecting energy from wind turbines doesn't work because "it only blows sometimes and lots of problems come about." On March 20, during a speech at an Army tank factory in Lima, Ohio, he said: "When the wind doesn't blow, just turn off the television darling, please. There's no wind, please turn off the television quickly." Earlier in March, Trump criticized the Green New Deal renewable energy policy while addressing the annual Conservative Political Action Conference in Maryland. Trump jokingly told the audience: "The Green New Deal—I encourage it. I think it's something [Democrats] should really promote…no planes, no energy. When the wind stops blowing, that's the end of your electric. 'Darling is the wind blowing today? I'd like to watch television.'" The policy proposals spearheaded by Democratic Representative Alexandria Ocasio-Cortez, of New York, and Democratic Senator Edward Markey, of Massachusetts, aim to tackle climate change by seeing the U.S. powered by renewable, zero-emission energy sources in the next decade. The president was also mocked on Twitter for his apparent lack of understanding of how wind works as renewable energy source. “I was taught how wind power worked in elementary science. Can a teacher please explain to Trump how wind energy works?” tweeted Marcel McClinton, a candidate for Houston City Council. Trump's own Department of Energy's Office of Energy Efficiency and Renewable Energy explains in its online FAQs why electricity doesn’t shut off when the wind stops blowing. The U.S. power grid is made up of many connected transmission lines. So while the wind doesn’t always blow, the grid is plugged in to a variety of sources. “Power grid operators have always had to deal with variability,” the website reads. Even traditional power sources can stop working without notice. “Grid operators use the interconnected power system to access other forms of generation when contingencies occur and continually turn generators on and off when needed to meet the overall grid demand. “Adding variable renewable power to the grid does not inherently change how this process of balancing electricity supply and demand works,” the FAQ states.